You might think that you have heard your fair share of tales, myths and occurrences at casinos. Guess what? I am here to prove you wrong! Ok, maybe not, but I come to tell you a couple of casino stories that will change your perspective and knock your socks off! All kidding aside, the truth is that in the crazy casino world, there are always new stories that are equal parts bizarre and amusing that have happened on the tables of your favorite casino games! Some of the most successful Roulette players in the past made their fortune not on luck but in probability using a system that had to do more with mathematics that with the bounce of the ball in the Roulette wheel. What exactly is a biased wheel? It is a roulette wheel that for whatever reason is unbalanced, so the ball tends to fall more in some regions than others. When you calculate the probability and interpret the information, you can end up making a killing on what seemed to be perfectly innocent bets. A famous example was the stunt pulled by well-known mathematician Albert R. Hibbs and his graduate student Roy Walford in 1946. The pair travelled to Nevada and studied the mathematical frequency of the roulette wheel bias of the Strip. Does that sound boring to you? I am guessing that after I tell you that they made over $42,000, which would now amount to $642,500, you would not mind hitting a math book or two. Before you go looking for your old Algebra books, let me tell you that things have changed nowadays. 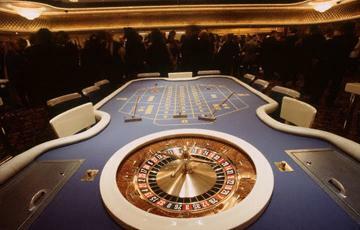 Casinos now have computerized the results of their Roulette wheels to immediately record and notify any anomaly on the randomness of the spins. If the system detects a biased wheel, they immediately fix it to minimize unfair winnings. So long to our Roulette Con Artist pipe dreams! This fearful winner was not even a regular of the casino; he was in town watching the NCAA Basketball Tournament and decided to bet $100 on a Megabucks Slot. Such an amazing win guarantees that he will receive 1.5 million dollars for the next 25 years. Nevertheless, the prospect of his wife getting mad at him made this guy go into a immediate frenetic attempt to have the lowest profile possible. Let’s just hope that when they managed to calm him down, someone made him see the big picture! You would have to be a very picky wife to get mad at your hubby for making almost $40 million; we guess that that wife changed her mind about gambling faster than a spinning reel! Create your own crazy victory stories by playing the exciting games that Silver Oak Casino has in store for you! Who knows? Maybe I will be writing about your success in no time!